Thinking of a career in academic neuroscience but worried about available opportunities in research? The University of Michigan Neuroscience Graduate Program graduates are well placed in academic research. At 10 years out, we still maintain a 62% balance of alumni working in academics. Our graduates are well prepared to place in these highly competitive positions. The Neuroscience Graduate Program has graduated over 225 PhD students since 1977. 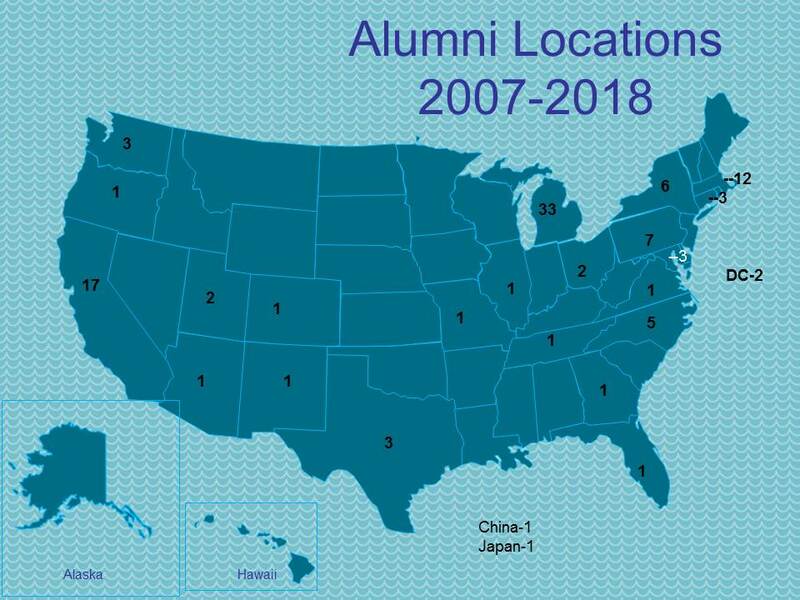 While the majority of our graduates remain in the U.S., we currently have graduates in the United Kingdom, Canada, Israel and China. We stay in touch with our alumni to follow their careers and learn of the exciting opportunities that are being afforded them. Every 2 years we host an alumni reception at the Society for Neuroscience Annual Conference which allows our alumni and faculty to reconnect and reap the benefits of a networking opportunity. Students receiving a PhD for the Neuroscience Graduate Program are highly successful. Many students get outstanding post-doctoral opportunities with top scientists at academic/research intensive institutions. A strong proportion of those then move on to a tenure track academic position, while many others receive attractive job offers in non-academic positions, such as public policy, scientific editing, NIH administration and medical private practice among others. PhD students are assisted in professional development via activities at the Neuroscience Program level, the Rackham Graduate School http://www.rackham.umich.edu/current-students/graduate-student-success/pd , Office of Graduate & Postdoctoral Studies https://ogps.med.umich.edu/resources/cpd/, the Medical School and University. They are helped in receiving academic post-doctoral and industry/governmental positions by their dissertation advisor, dissertation committee, and professional scientific/career mentors as well as the administration of the NGP.